These Russian Sugar Cookies (Молочные коржики) bring back great childhood memories of my mum making freshly baked cookies for me, usually devoured with a glass of cold milk after school. I think everyone has great memories of their mum’s baking cookies, whether it was American Monster Cookies or Russian Honey Pryaniki, cookies are universal. I remember my babushka (grandma) baking a version of these cookies, but her cookies weren’t as sweet. Sugar cookies are so simple, and variations are found across many cultures and even within Russia. These Russian Sugar Cookies (Молочные коржики) are a little bit thicker than most of the Sugar Cookies I’ve tasted. It makes the cookies less crunchy and softer to eat. If these cookies are crunchy, chances are that you over-baked them, and the sugars will taste burnt. These cookies are definitely not shortbread cookies. My mum would spend a few hours baking these Russian Sugar Cookies, and freeze the extras and pull them out as needed. We were set for months. As she took them out of the oven, the kitchen counter would be covered with these cookies, in a domino layered effect as they cooled. This simple, easy to make Russian Sugar Cookies are sure to be a hit, especially if you can make them in a larger batch (made easier by a KitchenAid MixMaster). Best enjoyed with hot zavarka чай (tea) or a glass of milk. Bon Appetit! Приятного аппетита! In a bowl, sift together the flour and baking powder until evenly mixed. Set aside. In another bowl, beat the eggs and half of the sugar together until smooth and creamy. 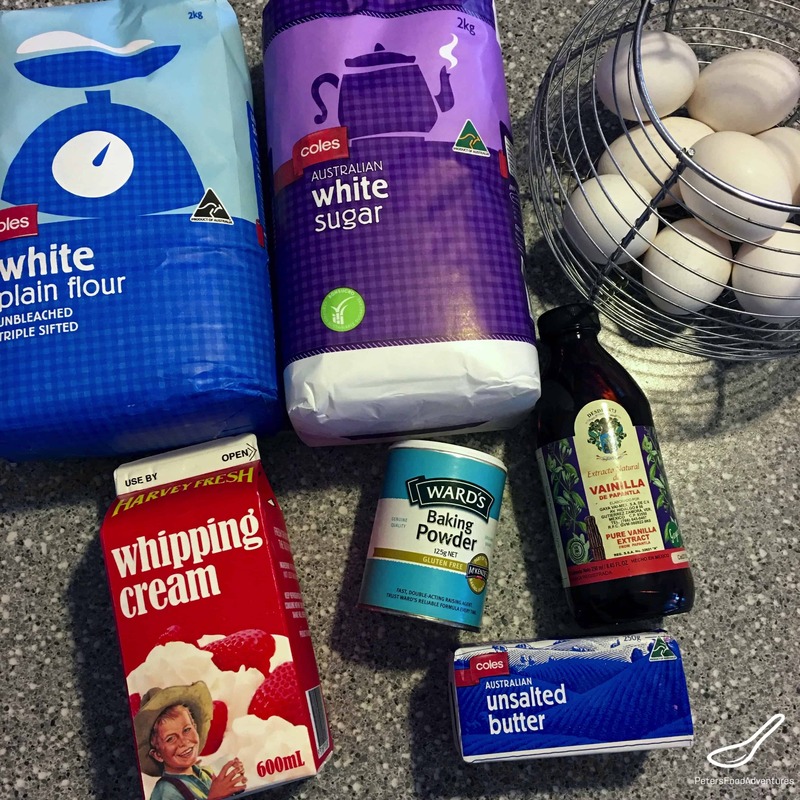 Add whipping cream and vanilla into the egg mixture and mix together. Set aside. 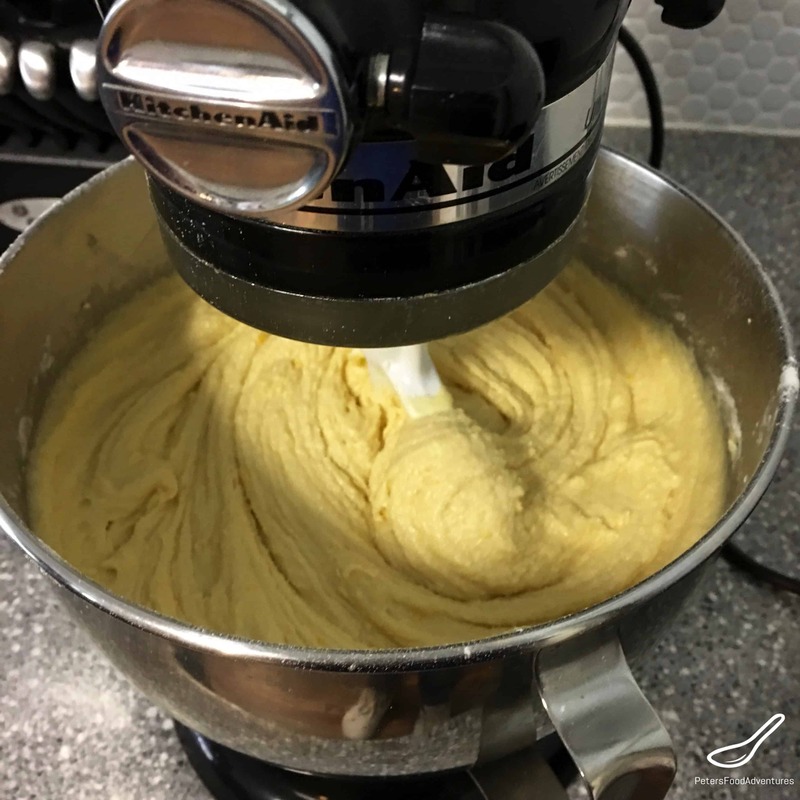 Using a KitchenAid Mixmaster, cream the room temperature butter and remaining sugar. Slowly add the egg and sugar mixture and mix until smooth. Gradually add in the flour mixture to your batter. Mix until combined into a sticky dough. Place your completed cookie dough the fridge overnight to firm up, otherwise its too soft to work with. If you don't have the time for overnight, prepare int the morning and bake in the evening. 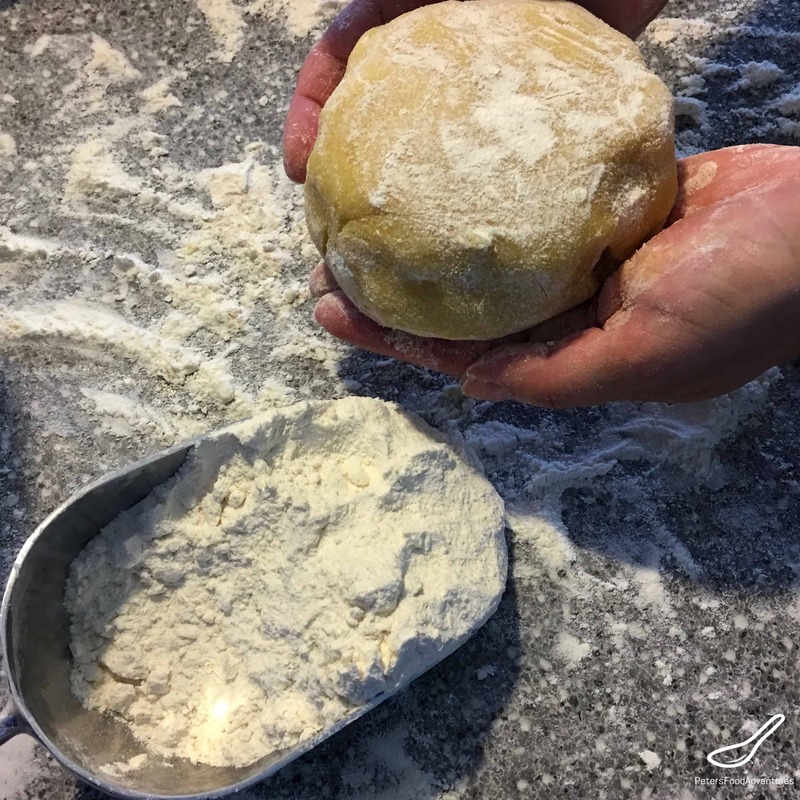 When the dough is firmed up, place on a well floured surface as you roll it out flat, about 8mm thick or ⅓ of an inch thick. Using a round cookie cutter, cut out pieces of cookies. Keep the working amount of dough small, about 4-5 cookie rounds at a time. The dough will be very soft and will require a fair bit of flour to keep from sticking. Prepare the cookie finishing dip. In a small bowl, place beaten egg yolks with whipping cream. Place 1 cup of sugar on a plate. 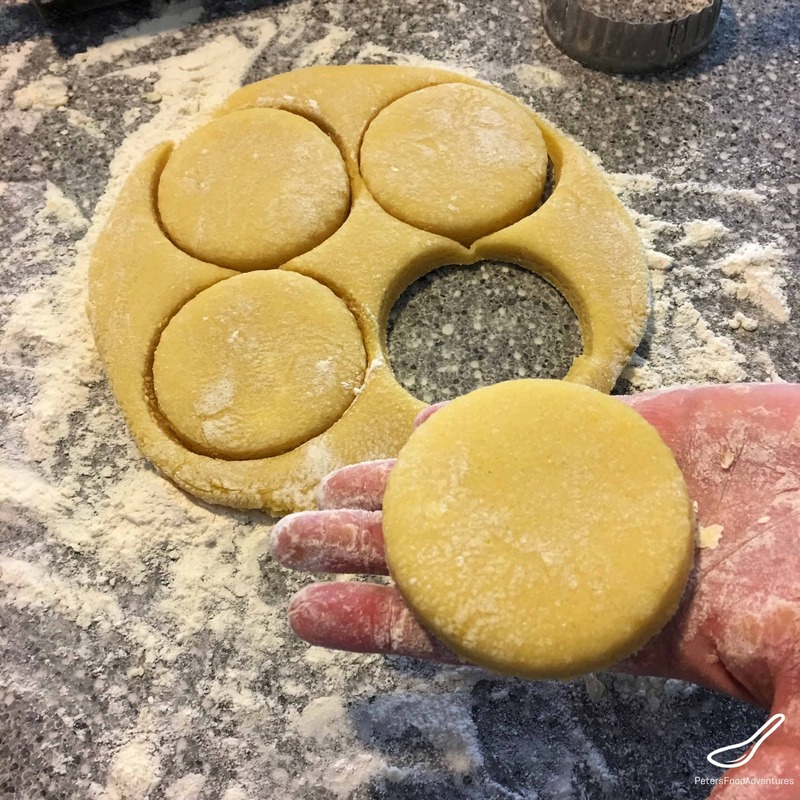 Pick up a cookie, using the pastry brush, coat the top of the cookie with egg wash. Flip the egg washed side of the cookie upside down into sugar plate, and place on a greased cookie sheet. Bake in a pre-heated oven on 350°F/180°C can reduce to 325°F/160°C if oven is too hot and cookies look like they are burning. Bake for about 10 minutes, keep an eye on it. They will start to have a very light golden colour. Be careful not to overcook the cookies. Remove the cookies from the oven. Using a flipper, scrape off each cookie and put on a cooling rack to cool. When the cookies are cool, put any extras into a ziploc bag and put in the freezer. Can defrost in the oven for a freshly baked taste! If you want to use less sugar, the dough will be less sticky, but the cookies obviously will be less sweet. These cookies look so perfect!! I can almost imagine how good they smell out of the oven. 🙂 Love that you guys had them to enjoy for months. So, total 3 1/2 cups of sugars, right? Wonderful cookies! Thanks! Yes, the last cup is for dipping the cookie tops, but are soooo delicious! ???? Is that 6 teaspoons of baking powder? Not 6 teaspoons of flour? Thanks! I would like to make these for my grandson’s International Night at his elementary school. Hi Marie! Yes, that is a silly typo! It’s baking powder! I have fixed it, thanks for letting me know! 🙂 Good luck with the International Night! Seems the cookies are really filling (but can’t stop – another one, another one….) and satisfying!! Haha! Definitely leave you wanting more and more!!! These cookies look really familiar to me. I will make this recipe to see if that’s the ones we used to have it as kids. Some of your recipes bring childhood memories of a food I already forgot about. Thank you for sharing. Thanks for checking it out Valya! Hope you enjoy them. They’re one of my kid’s favourite cookies, reminding them of their babushka. Why did my cookies come out really bitter tasting. One of my friends said it’s because of the 6 teaspoon baking soda that’s too much. I don’t know it was my first time making it and I’m bummed it turned it this way. Oh no! So sorry to hear that! You mentioned using baking soda, and the recipe called for baking powder, they do react differently in recipes. Too much baking soda in recipes will give a bitter taste, and this is likely the culprit. It’s a shame after all that work to waste the recipe! Please try it again with baking powder, and that will fix it! ??? ?